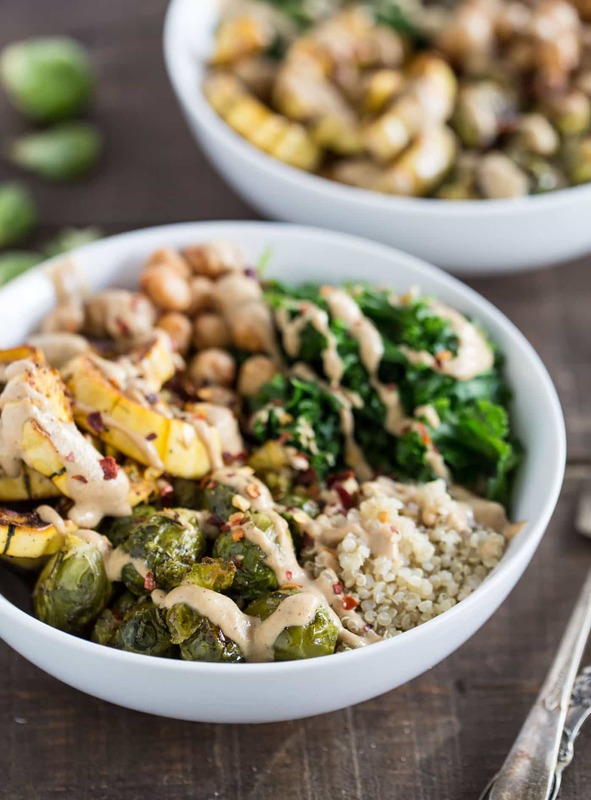 These cozy quinoa bowls feature some of my favorite fall produce, including roasted squash and brussels sprouts, steamed kale, and spiced chickpeas, but can be easily customized based on the ingredients you have on hand. It's a hearty, comforting and delicious autumn-inspired recipe! 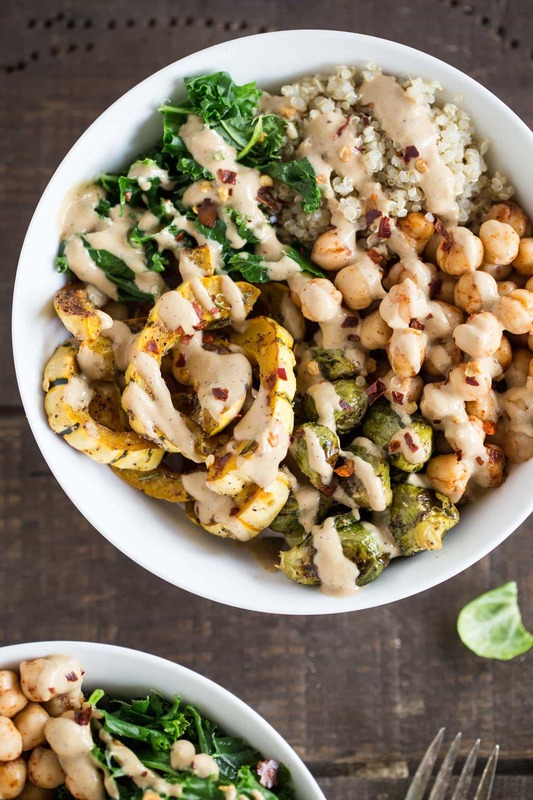 Quinoa buddha bowls have always been a go-to for me this time of year. I'm in Vermont for the week and it's gotten so chilly! We wake up in the dark, there's frost on the ground, and slowly my appetite has been shifting. Instead of cold smoothie bowls for breakfast and big salads for lunch, it's meals like this my body is looking for. Breakfast usually consists of two slices of my pumpkin quinoa bread, toasted with peanut butter and sliced banana on top. Lunch? A big quinoa bowl like this one. 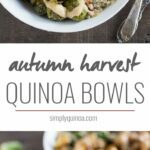 My quinoa bowls usually have the same formula, which is one of the things I love most about this type of meal. I love combining some sort of starchy vegetable–squash, sweet potato, etc.–a green vegetable, dark leafy greens, quinoa and a plant-protein. And of course, I top it with a creamy dressing of some sort. Today I'm using two of my favorite fall veggies: delicata squash and brussels sprouts. Delicata squash, if you aren't familiar with it, tastes kind of like acorn squash but it has a more delicate skin. So while you could peel it, you certainly don't need to. I often cook it like this; cut into half-moon shapes and then simply roasted until tender. If I had to choose, it's probably my favorite squash for this particular reason. Next up is brussels sprouts. Again, just a simple roast is all you need. I absolutely adore them! But if you're not a fan, as I know many people aren't, you could totally use broccoli, cauliflower or any other tough veggie. For the flavorings, it was just olive oil, fresh rosemary, salt, pepper and garlic powder. Simple is always better in my book. What is perfect about this meal for you is that it's really easy to meal prep. You can whip up everything ahead of time, pre-portion it out into containers, and have it for meals all week long! It won't take you more than 40 minutes to make this entire dish, which will end up saving you so much time during the week. Isn't it such a great feeling when you don't have to worry about cooking? Cut the squash in half lengthwise and scoop out the seeds. Cut into half moon shapes, about 1/2" thick. 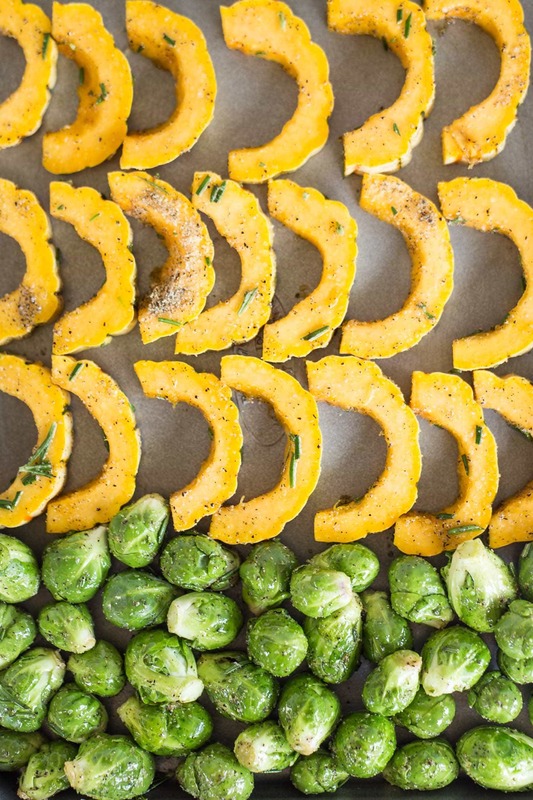 Add the squash along with the brussels sprouts, oil, rosemary, garlic powder, salt and pepper into a large bowl, and toss to combine. Transfer this mixture to a baking sheet and roast on the center rack for 30 minutes, flipping halfway through. While the veggies are roasting, steam the kale in a large steamer basket. Set this aside. In a separate bowl, toss together the chickpeas and paprika. 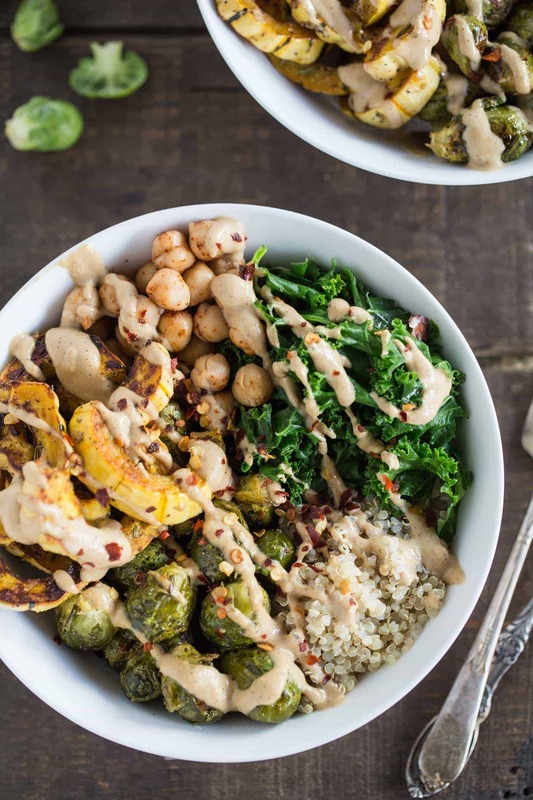 Assemble the bowls by dividing the quinoa, kale, chickpeas and roasted veggies evenly between two bowls. In a separate bowl, whisk together the dressing ingredients. Pour the dressing over the two bowls and enjoy immediately. Want more quinoa bowl recipes?